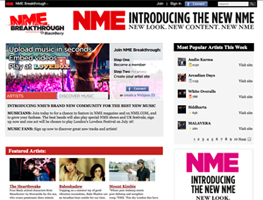 NME is launching a new social networking community for bands and fans, called NME Breakthrough. Musicians’ profiles will include streaming audio and video. NME music editor Jaimie Hodgson will mine the site for new talent to include in the magazine’s Radar section, which spotlights relatively unknown bands, and for other editorial opportunities. A band will also be selected from the site to play the opening slot at this year’s Lovebox festival. Adobe has repeatedly said that Apple mobile devices cannot access ‘the full web’ because 75% of video on the web is in Flash. What they don’t say is that almost all this video is also available in a more modern format, H.264, and viewable on iPhones, iPods and iPads. […] iPhone, iPod and iPad users aren’t missing much video. Erick Schonfeld of TechCrunch consulted with Encoding.com president Jeff Malkin, who estimates that about 66% of all online video — including mobile — uses the H.264 codec, which makes it the most popular format. All YouTube videos use H.264, and that site alone hosts 40% of all online videos. Flash, on the other hand, only comprises about 26%, down from 69% not too long ago. Microsoft is actually in agreement with Apple, and says that Internet Explorer 9 will support only the H.264 codec for HTML video. In other Apple-related news, the company has begun pitching its iAd mobile advertising to agencies. Initial ad buys are expected to reach seven figures, with a $10 CPM basis and a $2 click-through. Early last month, Apple changed its application developers’ license agreement to get rid of third-party advertising within apps, making it the sole ad provider on its devices. Image by Yutaka Tsutano on Flickr, used under its Creative Commons license.